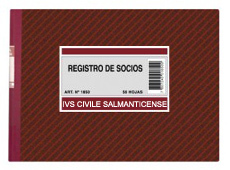 1.- Call for papers.- IVS CIVILE SALMANTICENSE (SALAMANCA’S NETWORK OF LATIN AMERICAN CIVILISTS) and the University of Salamanca’s Department of Private Law welcome submissions (full and short presentations) for its International Congress of Civil Law to be held in Salamanca (Spain), Hospedería Fonseca de la Universidad de Salamanca, from 24 until 26 October 2018. This Congress is intended to commemorate the 800th anniversary of the University of Salamanca. 3.- Who can submit a paper? Both established and early-career legal scholars are invited to submit papers addressing the topics referred to above, these include: law professors, lawyers, judges, PhD/DPhil/LLM/MJur students, and final year law students (short presentations only). 4.- Submission deadline.- Papers must be submitted by 31 March 2018. Full presentations: Between 25.000 and 45.000 characters (with spaces) for a 20-minute presentation. Short presentations: Between 8.000 and 15.000 characters (with spaces) for a 5-minute presentation. 7.- Selection process.- All papers will be peer reviewed by the organising committee. FOUR full presentations and SIX short presentations on each of the abovementioned topics will be selected. Papers will be chosen on the basis of academic rigour, quality, originality, structure, clarity and engagement with the Congress theme. The committee will notify the authors of all presentations sended, before 30th April. 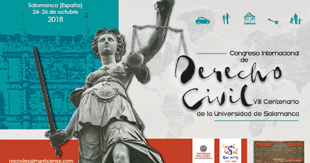 Both 16 full presentations and 24 short presentations will be delivered at the Congress and published in the Book of Proceedings of the International Congress of Civil Law: 800th Anniversary of the University of Salamanca. Full-presentation speakers will be given a 50% discount on the relevant registration fee. The organising committee may also select some other papers for publication in the Book of Proceedings. The authors of these papers will not be asked to present them. 1.- Both full and short presentations may be submitted in Spanish, English, Italian or Portuguese. 2.- Authors should prepare their full/short presentations (MS Word format) in Times New Roman 12; Line Spacing: 1,5; paper size A4. 3.- References should be given in footnotes, Times New Roman 11; Line Spacing: Single. 4.- Underlining is not encouraged. Please italicise book/journal article titles and foreign words. Otherwise, italics may be used in moderation. 5.- Please create a table of contents, and use numbered headings both within the table of contents and throughout, i.e. 1, 1.1, 1.2, 2, 2.1, 2.2. etc. 6.- Please provide a summary for each heading. Please also provide an abstract in both Spanish and English.